Two political models are presently being cited by supporters of Prime Minister Prayut Chan-o-cha as vehicles for his continuation as premier after the general election of 2017. One is the so-called “Prem Model”, a reference to the era of Gen Prem Tinsulanonda who was prime minister between 1980 to 1988. The other is the setting up of a military-backed political party to become the core in the formation of the next government. They are not the same. But both are archaic in nature, semi-democratic in practice, and unfortunately, could be used again in the near future. Gen Prem became premier after Gen Kriangsak Chamanan resigned. Gen Kriangsak was the main force behind the Oct 6, 1976 coup following the bloody crackdown on the student movement. The coup-makers put in place a right-wing civilian government, with a vision of being in power for 12 years to get people “ready” for a return to democracy and another election (sound familiar? — these ideas never die), that became immensely unpopular. Gen Kriangsak staged another coup on Oct 20, 1977, took over the premiership, drafted a constitution and called an election in 1979. With no clear winners in the election results, political parties agreed to ask Gen Kriangsak to continue in the top job until he lost the political game. Gen Prem, then army commander-in-chief and deputy defence minister, stepped up as the new power figure with the support of the military, the technocrats, the urban elites and the political parties who endorsed him with the votes in parliament. Gen Prem was able to sustain power for eight years, during which there were three general elections (1983, 1986 and 1988) and two failed coups d’etat (1981 and 1985). Each time the interplay was the same, the political parties, without a strong leader, gave in to the powers-that-be and handed the premiership to Gen Prem. In 1988, he was again “invited” but he said he had “enough”. The general election in 1989 opened a new era of Thai democracy as Gen Chatichai Choonhavan became the first elected premier and was deposed in a coup in 1991. If Gen Kriangsak had been more successful, it would have been called the “Kriangsak Model” and not the Prem Model, but they are essentially built on the same principles. The context for such a design was the perceived threat of a communist insurgency with the support of China. It had to be countered by a government with a semblance of democracy, to provide an open channel for inclusiveness of differences in opinion, while maintaining stability through a strong military presence and decisiveness. It was called prachatipatai krueng bai or “semi-democracy” by the media. To give due credit, it was Gen Kriangsak who passed the amnesty bill for those who fled to join the communist insurgency in the jungles throughout the country in the wake of 1976 massacre. And it was Gen Prem’s PM Order 66/23 which set the strategy to win over the hearts and minds of all Thais, politically and economically, in conjunction with military operations. They were all instruments of a different era. The Cold War ended. The communist-capitalist conflict closed another chapter of world history with the fall of the Berlin Wall in 1989. The “military-backed” political party model was more of a raw deal. It was tried twice and failed both times. In 1968, Field Marshal Thanom Kittikachorn, after almost a decade of running a military government, tried a move toward becoming a democratic government under a new charter. He set up the Saha Prachatai Party as a vehicle to stay in power. He failed to get a majority but as the party with the most MPs, via a coalition, he remained premier. However, this was not tolerated, and in an outlandish move, he staged a coup against his own government. The action led to more public discontent, exploding in the Oct 14, 1973, student uprising. Field Marshal Thanom fled the country. In 1991, after the putsch against the Chatichai government, and installation of a new constitution, the military regime set up the Samakkhi Tham Party, gathered many political factions, and backed Gen Suchinda Kraprayoon, the strongman at the time. They were able to muster more MPs than other parties. But the public mood was against an unelected premier. So when Gen Suchinda assumed the post against his earlier promise not to, the urban middle class took to the street in pro-democracy rallies which ended in the May 1992 bloodshed that ousted the government. It is a wonder why anyone would again want to try such a venture. But a variation of both may be on the table. Gen Prayut has been coy in reacting to ex-senator Paiboon Nititawan’s move to set up a political party to support him as premier after the election. Realistically, his party would not win a majority, but it could gain a few seats for leverage in the parliamentary numbers game. Whatever seats he wins plus a few from other sympathetic parties, when combined with the 250 regime-appointed senators, the power balance lies with you know who. Other political parties may not have much choice. The suppression of political activities remains in effect. Political parties cannot meet legally. It is anticipated the new political party law could force a “set zero” scenario requiring all parties to re-register and all members to re-apply. This will lead to factionalism breaking out especially from Pheu Thai. First, the ongoing political conflict is different to the 1980s. The present one has no outside power interference, and is basically “home-grown”. The injustice of the system alienated the new rural middle class. These were the ones who when Thaksin Shinawatra and Thai Rak Thai delivered its progressive agenda of equal opportunity — political and economic — believed and joined the bandwagon. Democracy at the turn of the millennium was the answer to their woes. Coups stole those opportunities. “Semi-democracy” is viewed as an excuse to preserve the status quo for the few. To suppress is only to fuel the furnace and an explosion could follow. More democracy, not less, must be built with trust for a level political playing field. Second, diversity in society is more pronounced as a result of globalisation and social media. Of course, not all diverse demands can be satisfied. But at least there must be an opening for those differences to be voiced. The government cannot impose its will, no matter how good it believes its intentions are, on the people. A 20-year strategic direction for one may not be the course wanted by others. Participation and inclusiveness is the key to acceptance. Third, if Gen Prem’s 66/23 Order was rapprochement, Gen Prayut has so far achieved little, if anything, in reconciliation. There has been no peace offering. The regime rules by enforcing its own laws or interpreting existing ones on political opposition in the name of preserving stability and national security. Rule of law is essential but it must be applied equally to all in conflict via a fair, transparent judicial process. Justice is the foundation for reconciliation. Lastly, do not underestimate the Thai public. Raw power grabbing won’t be tolerated. 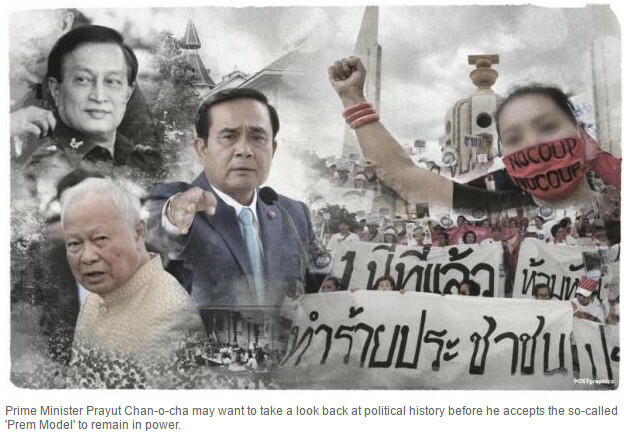 If Gen Prayut appears self-serving after the election, he should look at history and how it will determine his fate. Suranand Vejjajiva was secretary-general to the prime minister during the Yingluck Shinawatra government and is now a political analyst.